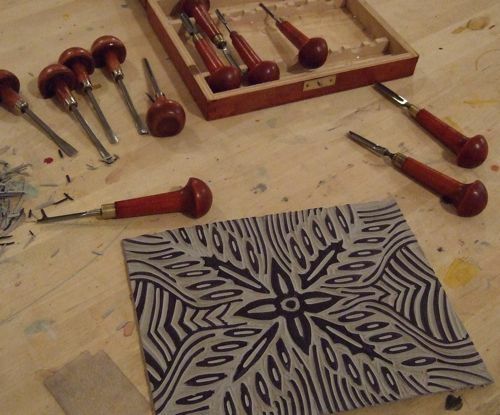 PrintSocial is an exchange between two or three people during the process of making an editioned linoleum print. It is an idea I dreamed up after having to move my studio to my home. It serves many purposed but the two primary ones are: I always wanted to have a printshop and invite people to come and make a print – thus I play the role of a print publisher on a tiny scale. Second, after moving my studio home it became very isolating to sit and carve alone all day so I thought I would invite someone once a week to join me. No experience necessary. You do not need to be an artist. In fact not being an artist is a plus. It will take 3-4 hours. You must like dogs. They will bark at you when you first arrive. You must be able to work in small spaces. After all I am in NYC. Ideally you like to share ideas, talk, but it is not required. Mostly I only book Sunday afternoons but will make an exception. You will print 10 prints plus 2 artist proofs – 12 in total. I will explain what all that means. I will keep 3 and sell two for $35 each. This helps to pay for paper and supplies. This is obviously not a business venture. You can draw directly onto your 8″ x 6″ linoleum plate or you can bring a photo, drawing, any image and transfer it to your plate. The only real planning you need to do is know what you want your image to be and that you will make is 8″ x 6″ and print onto 15″ x 11″ paper.